Common French expressions rooted in ordinary equipment of the baker's trade, respectively to be in trouble, and to have a lot of work to do. Pavailler oven, electric, four decks, eight doors, three baguettes deep. Bottom photo by the baker, 30 May 2012. 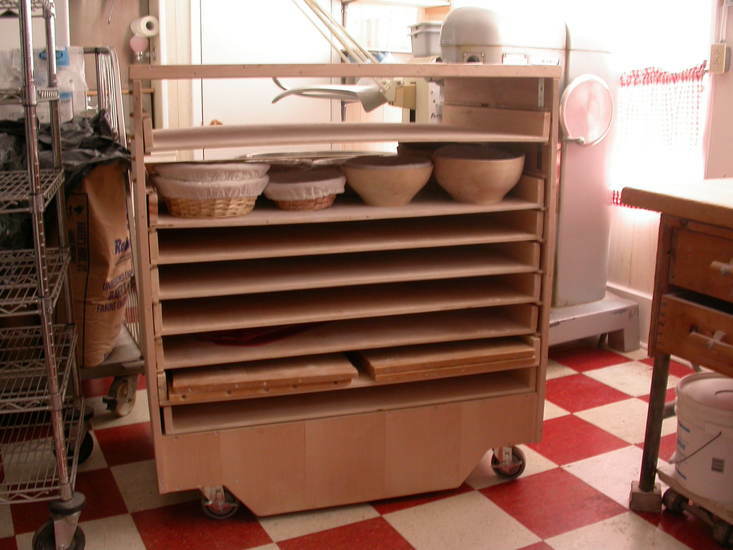 From left to right: electrical panel, divider-rounder, retarder (chambre de pousse controlée), bakery sink, with rolling table and planche carrier in foreground. Note that on the top shelf of the 'planche carrier' there are 10 baguettes in their 'final proof', sur couche (on proofing linens), while above several couches a, hang to dry.